In cookbooks and recipes, it isn’t common to see acorns as an ingredient and for good reason: their shells are hard to crack, the nutmeat bitter-tasting. While diminishing the prospects of an acorn feast, these traits help the acorns survive. The hard shells protect the seed from damage and make it harder for predators to reach the soft internal tissues of the young oak. Meanwhile, the bitter flavor comes from “tannins,” compounds that act as another deterrent to predators and which also provide some disease protection. Eating acorns rich in tannins can cause an upset stomach and at the very least leave an unpleasant taste in the mouth. Acorns once featured prominently in the culinary lives of people around the world and still do in some Korean and Native American cooking, particularly along the West coast. Prepared properly, the oak seeds can provide a starch not unlike wheat flour; something that, once paired with other foods, is very flavorful. Acorns are not limited in their uses, either. From soups to jellies, breads to puddings, they add their unique flavor to a variety of dishes. At Oak Spring, we decided to try making acorn flour for ourselves. From foraging to feasting, this is how we spent a couple days in the woods and the kitchen to make our own tree to table treat. The first step is to collect the acorns themselves, ideally from a white oak. Red oaks (examples include Quercus velutina and Quercus rubra) tend to have more tannins than white oaks (Quercus alba, for instance). We used this latter species for our acorn collecting. Collect more acorns than you want flour, as some will be unusable. 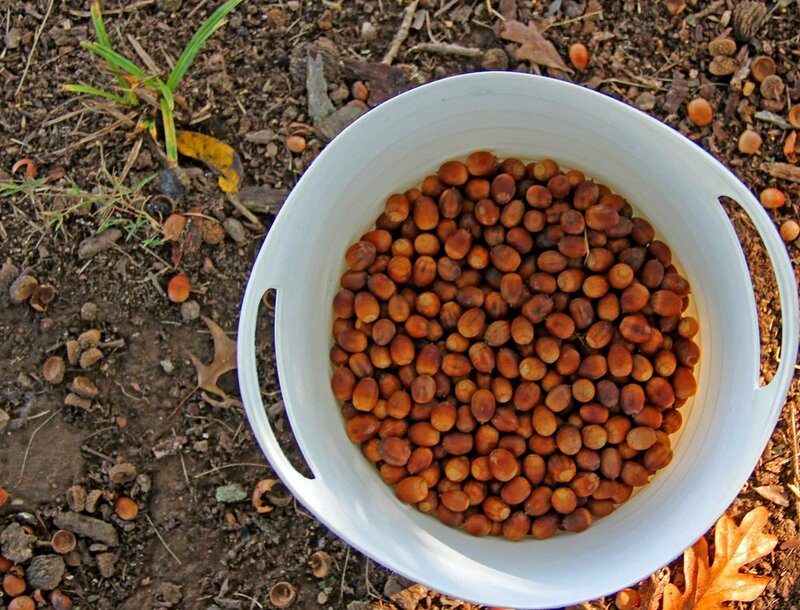 There are a couple things to look out for when gathering your acorn harvest. Avoid ones with holes in them, as these likely have been eaten by acorn weevils. Also avoid acorns that are dull in color (these tend to be old and don’t taste as good) and also avoid ones with caps still on. Once you have collected sufficient acorns, there’s another step to remove faulty acorns from the batch. Put all of the acorns in a big pot and then fill it with water – the ones that float to the top probably have weevils in them, so you can go ahead and throw those away. Next, we have to dry the acorns. Drying is an essential step before shelling; without being dried beforehand, the shells are difficult to crack open and hard to separate from the nuts themselves. This can be done either in a food dehydrator or in the oven; at Oak Spring, we used the oven. At a low temperature (around 100-150ºF), roast the acorns for about thirty minutes, then remove and let cool. Repeat several times, allowing the acorns to sit for about 15 minutes after each 30-minute roast. This dries the acorns out while also preventing them from burning. Once the acorns are dry, then you will need to shell them. This part can take quite a while – acorns are not easy to crack open. Find a flat surface (we just kept them in the baking pans from earlier), cover the acorns with an old towel, and bang on them with a heavy object. Be careful–unless a cloth is tucked around the baking pan, the acorns will go flying out the sides. Hitting the acorns too hard can also dent the pan, but the acorns will sometimes take quite a bit of force before cracking. A rolling pin is also useful at this stage, to open any particularly stubborn nuts. Be careful, too, not to fully pulverize the acorns–you don’t want any errant bits of shell finding their way into your supply of edible nutmeat. Once the shells have been removed, there sometimes remains a bit of testa, or papery seedcoat that surrounds the acorn nut. Make sure to scrape this off as it, like the acorn shell, is not edible. You also might come across a few seeds that have weevils in them. Needless to say, but these are inedible. Discard the shells, testa, and inedible seeds. Now we need to remove the tannins from the acorns, a final step before they become ready to eat. Traditionally, people would tie the acorns in a cloth bag and set the bag in a stream; the streamwater would do all the work in removing the tannins. A few people still use this method, but for most it’s a safer bet to use the kitchen. 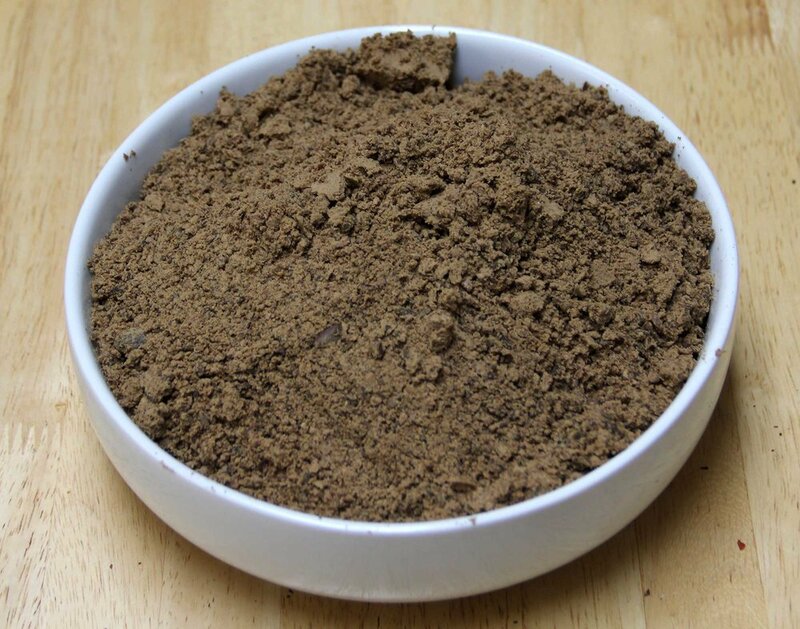 Today, there are two main ways of removing the tannins: cold leaching and hot leaching. Cold leaching involves filling a jar with the nutmeat and water and, over the course of a month or so, pouring out and replacing the water until it stops turning brown. The transition from brown to clear water is a good indicator of edibility – acorns with tannins removed will not make the water turn dark. While there are benefits to the cold leaching process, mainly that it keeps more flavor in the acorns than hot leaching, it does take quite a while. For the sake of time, we got rid of the tannins by boiling the acorns. Boil and strain the nutmeat repeatedly until they are not bitter to the taste. 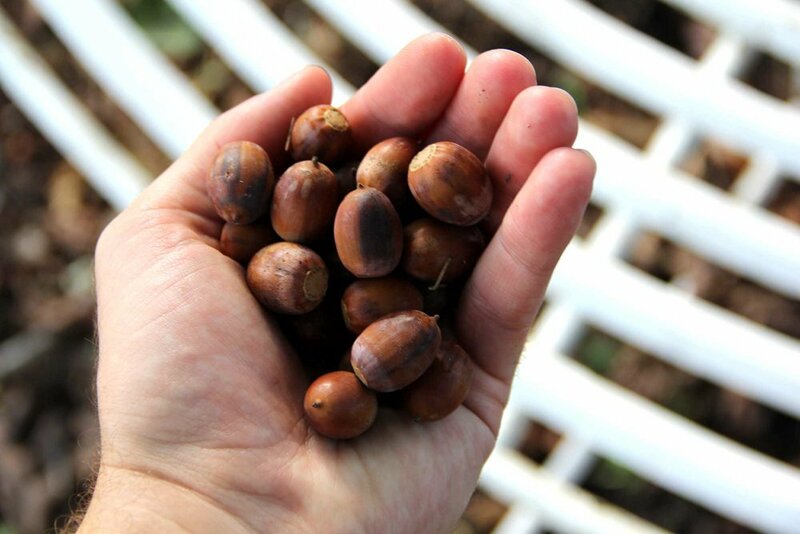 Once you have boiled out the tannins from the acorns, you should have a collection of softened acorns. These processed nuts are edible as they are, but they won’t taste like much–just a vaguely nutty mush. To make them usable in other recipes, we want to turn them into flour. With a food processor, grind up the nuts into a fine powder. Once all the nuts are ground up, you have your acorn flour! Now what to do with the flour. 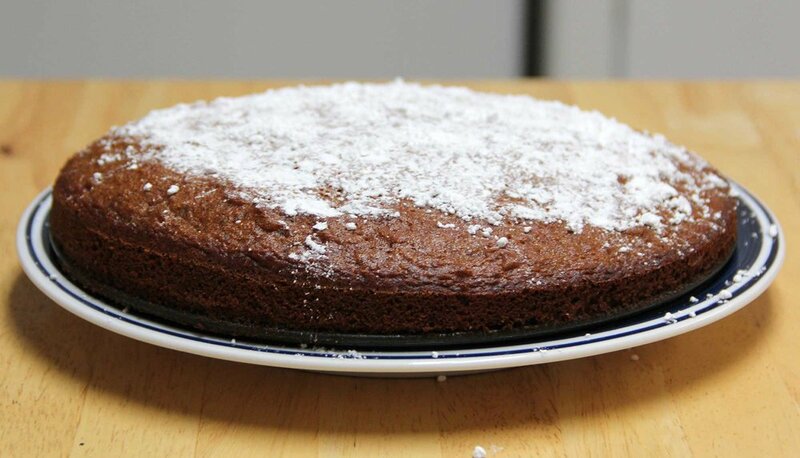 There are a variety of recipes all over the internet; we used a cake recipe from Hunter Angler Gardener Cook. But there are other recipes for acorn soups, jellies, and breads online and in books. Check them out, and let us know your favorites. For people interested in local foods, fans of oak trees, or even just those who like that unique nutty taste, acorns can be a delicious addition to your diet.